In the month or so since I wrote the following review, I have been thinking about Can Xue, about what it is that sets her work apart—that makes it so difficult and so addictive. There is nothing intrinsically complex about her language. Her characters are intriguing, interesting. But one can easily feel unmoored within the scope of her imagination. Borders shift; the signposts we look for as readers are missing or misleading. But once one accepts this condition, the possibilities are endless and exciting. After reading Can Xue, I went on to read João Gilberto Noll and Michel Leiris. In the light of this subsequent reading there is more I would like to explore with respect to the dream-like narrative/anti-narrative, but that will have to wait until after my next Numéro Cinq review. It can be said that Chinese experimental writer, Can Xue, inhabits a strange and elusive territory in contemporary literature. With an idiosyncratic approach to writing, she has created an impressive body of work that effectively explores a geography of the spirit—mapping, if you like, the space where the real and the surreal, the personal and the political, and the magical and the mundane meet. 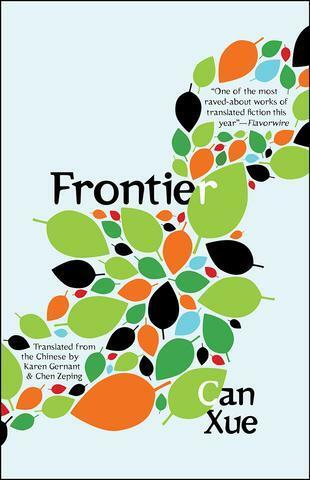 Her 2008 novel Frontier, newly released from Open Letter Books in a crystal clear translation by Karen Gernant and Chen Zeping, has been eagerly anticipated by her admirers. Yet, for intrigued newcomers, it may well offer an excellent introduction the dazzling, and baffling, world of Can Xue. Born in 1953, in Changsha City, Hunan Province, South China; Can Xue is the pseudonym of Deng Xiaohua, who took her intentionally gender-neutral penname from a Chinese expression that refers to both the dirty snow that refuses to melt and the pure snow remaining at the top of a high mountain. This inherent duality is very fitting. In the years leading up to the Cultural Revolution, both of her parents came under suspicion for their journalistic activities and were sentenced to hard labour. Consequently, their daughter was unable to continue her education beyond elementary school. Despite the brutal hardships her family experienced and her own ill health, Can Xue showed great resilience. With her schooling cut short, she turned to reading. Largely self-taught, she read fiction, poetry, and discovered the joys of classical Western and Russian literature, eventually going on to study and read in English. At the same time, she married, started a family, and worked as a tailor before publishing her first work in the mid-1980s.